At weddingcardsdirect.ie we have a great range of wedding invitations aimed at parents getting married. If you and your partner already have kids or have kids from a previous relationship you will want your kids to play a major role in the celebration, such as ring bearers or flower girls. Have your thought about the wedding invitations coming from your kids? We have a fantastic range of children inspired wedding invites at weddingcardsdirect.ie from “My Mum said Yes!” cartoon wedding invites to “My Parents are getting Married” wedding invites to Beauty and the Beast themed wedding invites or how about getting your kids really involved in your wedding and get them to do a drawing for your wedding invite. We have blank templates online at weddingcardsdirect.ie just go to this template and upload your kids drawing insert your words both on the outside of the card and inside, order it, and wow you’ve got a very personalised fun unique wedding invitation designed by your children and delivered to you in five days. This type of wedding invitation make a great reminder of your wedding day for your family and friends. 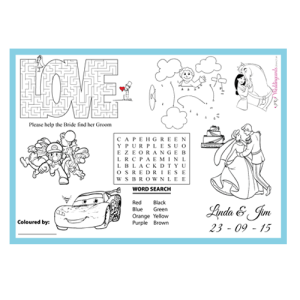 Our designers at weddingcardsdirect are very creative people. Not only have we come up with great on trend wedding designs for wedding stationery we have even thought about how to entertain the little guests at your wedding! Kids under 7yrs love coloring we have created coloring paper place-mats in A5 and A4 sizes for the kids table. 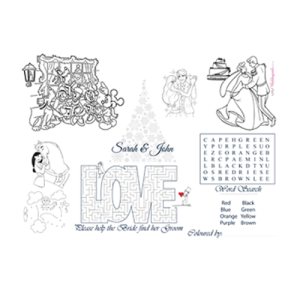 Order from our current coloring mats themes online or tell us what you want on it. 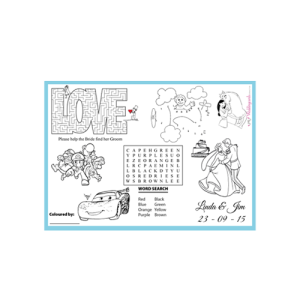 It could be a puzzle theme around your wedding, Bridesmaids dress design and color place-mats for the girls, for the boys design and color the wedding car place-mats or puzzles place-mats around the latest kids movie theme and movie color characters place mats. Our advise is be prepared for the little guests with lots of kid friendly entertainment the kids table. Wedding Cards Direct © 2019. All Rights Reserved.